One of the best known fictional depictions of business is Arthur Miller’s 1949 play, Death of a Salesman, which tells the story of a traveling salesman who has reached the end of his road. Several fine films have been made of this drama, and in 1984 Dustin Hoffman starred in an acclaimed revival of it. The story is told through the memories of the weary, confused, pathetic salesman, Willy Loman. In his early 60s, he has worked for thirty-four years for Wagner Company and wants to believe that he is vital to the company’s operations in the New England area. The action takes place in New York and Boston over a two-day period. The play involves a succession of scenes that flow freely through time, fluctuating between the somewhat distorted and distant past and present. The majority of the action occurs in the Lomans’ home. The story begins with Willy returning from an extended Florida sales trip to his home in Brooklyn. The exhausted salesman daydreams, has difficulty remembering, and cannot distinguish between the present and his memories of the past. He hallucinates and his mind shifts rapidly between past, present, and his imaginings, with all three seeming real to him. The worn-out salesman nearly wrecks his car and when he arrives home he tells his wife, Linda, about his wandering mind and his near accident. She tells Willy that his mind is overactive and that he needs to rest. In an attempt to persuade him, Linda suggests to Willy that he should ask his boss, Howard Wagner, for a sales position in a New York showroom so that he would not have to travel. Howard is the son of the man who hired Willy many years ago. Willy says that he will talk to Howard. He then complains about his son Biff’s lack of success. Willy has long envisioned Biff becoming a successful, well-known, and well-loved businessman. Willy’s sons, Biff and Happy, are upstairs and can hear Willy talking to himself. Neither son is successful and both are unhappy with their jobs. The aimless Biff has lived his life as a worthless drifter for many years. He had been a great athlete in high school but did not attend college because he failed math in high school. He has learned from his father that being well-liked is more important than being academically superior. Biff is caught between his love for his father and his need to get away from his father’s influence. Happy is a charismatic womanizer who enjoys the appearance of success. Happy lives in Biff’s shadow but he has adopted Willy’s value system. Willy is unequal with his sons, tending to praise Biff and to ignore Happy. Sharing Willy’s capacity for self-delusion, Happy wants to emulate his father in order to get attention. Biff’s notion of the American Dream is to go out West and run a ranch. While still upstairs, he and Happy discuss buying a ranch together. Downstairs, Willy is daydreaming about episodes from the past—Biff stealing a football while in high school; his sons visiting him in Boston; returning from a trip and telling his boys that he will open his own business someday that will be bigger than Charley’s business; his neighbor Charley’s son, Bernard, telling Willy that Biff is failing math and needs to study; Willy commenting that Bernard and Charley are liked but not well-liked, and so on. Willy recollects a conversation in which he brags and exaggerates his sales and commissions earned to a younger Linda. She recalculates much lower numbers and realizes that he has inflated them in order to feel and to appear more successful. Linda feeds into his delusion by reassuring him. Willy remembers complaining about his physical appearance and Linda tells him that he is attractive. Aware of her husband’s evasions and weaknesses, Linda nonetheless loves Willy, is loyal to him, and constantly comforts and supports him. Linda tries to keep her family intact. As a realist, she is the authentic leader of the Loman family. Willy then recalls the woman with whom he once had an affair. The vision of the woman disappears and Willy realizes Linda is mending her stockings, a symbol of Willy’s infidelity because he had given stockings to the woman. She tells Willy to remind Biff to return the stolen football. The older Happy goes downstairs to hear Willy expressing his regret about not joining his brother Ben in Alaska. Ben ultimately became rich when he discovered a diamond mine in Africa. Willy’s close friend and empathetic neighbor, Charley, comes over to play cards. Charley offers Willy a job that he turns down. Willy then imagines that he is talking to his brother Ben who has recently passed away. To Willy, Ben is the personification of glamour, success, initiative, and self-reliance. The confused Charley departs and Willy asks Ben for advice. Linda appears and Ben meets her. Willy remembers asking Biff and Happy to steal lumber supplies to remodel the porch. Bernard rushes in to announce that the watchman is chasing Biff as he attempts to steal supplies. As the play returns to the present day, the brothers have come downstairs to discuss Willy’s behavior and ramblings with Linda. She tells Biff and Happy that Willy has been put on straight commission and that he has been consistently borrowing from Charley to make ends meet. Linda admonishes her sons for the way they treat and talk about their father. She says to give Willy respect or not to come home. Biff states that Willy is a fake but he does not elaborate. Linda tells her sons that Willy has attempted suicide. Willy hears his wife and sons talking, enters, and argues with Biff. Happy announces that he and Biff might go into the sporting goods business. As a result, Willy cheers up and gives Biff advice on how to conduct himself when he interviews with Bill Oliver. Later, Linda asks Willy what Biff has against him. Act II begins the next morning with Willy getting ready to go to ask Howard Wagner for a non-traveling position in New York. At breakfast, Willy expresses anger about the high price of appliances. Linda tells Willy that his sons are taking him to dinner that evening. Willy arrives to ask Howard to reassign him to a position in New York, but Howard is preoccupied with his new recording machine. The second-generation owner barely pays any attention to Willy’s request and is intent on showing off his new recorder. Pointing out his many years of faithful service to the company, Willy makes his plea to Howard. Willy intimates that he once was a successful salesman. Of course, the truth is that he had never been a good salesman. Howard says that no such position is available. Willy raises his voice and reminds Howard that he played a role in naming him. Willy bases his appeals to his employer on his images of the past. Willy relates to Howard how legendary salesman Dave Singleman inspired him to go into sales. At the age of eighty-four, Singleman could simply go to a town, make a number of phone calls, and obtain numerous orders without even leaving his hotel room. He told Willy that selling was the greatest career that a man could ever have. Unlike Willy’s brother Ben, Singleman represented success that he saw as potentially attainable. He died the noble “death of a salesman” in the smoker of a train while on a business trip. When Dave died, hundreds of salesmen and buyers attended his funeral. Willy had wrongly attributed Singleman’s success to his personality traits rather than to his well-developed sales strategies and tactics. Howard fires Willy, saying that he wants Willy to take some time off. He says that he does not want Willy to represent the company any longer. He adds that he has been “meaning to tell” Willy that for a long time. Willy brings about his ultimate dismissal himself by going to meet with Howard. Howard had both ignored and carried Willy for a long time. He recently did put Willy on a straight commission, but he had not been totally honest with Willy or with himself. A manager should give each person what he deserves and Willy’s always poor sales had been getting even worse. Howard had waited too long to level with Willy. When a manager is honest and just with an employee, then it is more likely that the employee will be honest with himself. It is essential for a manager to give each employee what he deserves. Such a perspective on justice recognizes that good job performance brings value into existence for the company and that poor job performance does not. Both the person receiving just treatment and the company bestowing that treatment thereby benefit. Willy should have been evaluated objectively and justly throughout his career. He would then have been more likely to follow a career better suited to him. Memories of Willy’s past fill his mind. As Howard departs, Ben enters and Willy asks him for advice. Ben offers Willy a job in Alaska. This offer presented a crossroads to Willy early in his life—he could either pursue a career as a salesman or join his adventurous brother. The younger Linda enters and reminds Willy of his sons, his sales job, and the success of Dave Singleman. Willy’s memories drift to Biff’s final football game. Bernard and Happy are excited about the game. Willy speaks optimistically to Biff about the game. Charley arrives and teases Willy by acting as if he is unaware of the game. Willy returns to the present when he arrives at Charley’s office. Charley’s secretary asks Bernard to calm Willy down. "Throughout the play, the connections between the salesman’s inner fantasy world and external reality grow ever more volatile and unstable, as evidenced by his dreamlike ongoing inner dialogue with a variety of characters in which the past merges with the present." Bernard is about to leave for Washington, D.C. to present a case to the Supreme Court. Curious about Biff’s lack of motivation and success, Willy asks Bernard why Biff has always been such a failure. Bernard says that something changed in Biff following his visit to Boston to see Willy right after high school. The defensive Willy states that he is not to be blamed for Biff’s lack of success. Charley arrives to send Bernard off to Washington and Willy asks Charley for more money than usual because of his insurance payments. Once again, the empathetic neighbor offers Willy a job. The insulted Willy turns it down but eventually admits that he has been fired. Charley admonishes Willy for always wanting to be well-liked and angrily gives him the money, continuing his well-intentioned practice of giving Willy a free handout. As a result, Willy has had less incentive to change by finding a job to which he was better suited. At Frank’s Chop House, the restaurant where Willy is to meet his sons, Happy assists the waiter, Stanley, in preparing a table. Biff enters and Happy introduces him to a call girl that he is flirting with. The distraught Biff says that he waited for six hours to see Bill Oliver and that Oliver did not even remember him. During his ordeal, Biff realized that he had not been a salesman for Oliver but had only been a shipping clerk. It appears that Biff had recollected his father’s misconception that Biff had been employed as a salesman for Oliver. Biff tells Happy that after he left, he went back to Oliver’s office and stole one of his fountain pens. He tells Happy that he has stolen himself out of every job that he has ever held. When Willy enters the restaurant, Biff attempts to tell him what transpired when he went to see Oliver. Willy interrupts and says that he has been fired that day. Biff tries to complete his story but Willy keeps breaking in with his own comments. Biff blows up at his father for his inattentiveness. At this point, Willy begins reliving the past once again. He remembers Bernard telling Linda about Biff failing math. He then recollects Bernard telling her that Biff was going to Boston to see Willy. The restaurant conversation in which Biff is attempting to explain what has just happened to him intermittently comes back into focus. Biff claims that Oliver is discussing with his partner the notion of supplying Biff with money. This renews Willy’s interest and he begins to ask delving questions. Biff yells at Willy who becomes very confused. Willy thinks about Boston, the woman he had an affair with, trying to hide her in the bathroom, her laughter, Biff finding out about her and calling Willy a fake, Oliver, and so on. Ultimately, Biff rushes out of the restaurant and Happy leaves with two girls. Returning to the present, Willy recognizes that he is still in the restaurant with the waiter, Stanley. Willy wants to locate a seed store and Stanley gives him directions to one. Willy returns home to plant a garden at night. He appears to think that by planting the seeds he is establishing the worth of his labor and his own worth. Willy is discussing his suicide plans with Ben. Biff finds his father planting seeds in the garden with a flashlight. They argue, but reconcile somewhat, and Biff attempts to say goodbye. Happy goes to the Lomans’ kitchen looking for Willy and finds his mother there. When Biff comes inside the house, Linda berates her sons for forsaking their father. Ben comes back into sight and reminds Willy of his $20,000 insurance policy. In Willy’s mind his suicide would provide his family with money, would prove that he was a success, and would symbolize some sort of unity of the generations. Willy’s car speeds away as he leaves to kill himself believing that, because of his popularity, a lot of people will attend his funeral. The Requiem to the play takes place at Willy’s graveside. The only people at his funeral are the two boys, Linda, Charley, and Bernard. At the service, Biff declares that Willy had the wrong dream and the empathetic Charley tries to provide Willy with some dignity by saying that he was a victim of his profession. The attendees feel a mixture of sadness, anger, and relief. 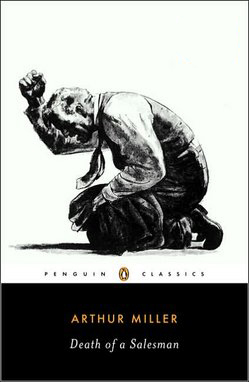 The original title of Miller’s play, “The Inside of His Head,” refers to how Willy’s mind wanders between reality, flashbacks, and delusions. His mind wanders because he has lost control over his life just as he lost control of his car in the beginning of the story. Throughout the play, the connections between the salesman’s inner fantasy world and external reality grow ever more volatile and unstable, as evidenced by his dreamlike ongoing inner dialogue with a variety of characters in which the past merges with the present. Willy is truly a “low man” who is forced to face his failures as a salesman, father, and husband. For the most part, the audience (or readers) of the play can only imagine how or why he became what he is. What is known is that Willy imagines himself to be someone that he could never be. He desperately wants to believe that he is well-liked, a great salesman, a good father, and a devoted husband. Willy believed that attractive, well-liked salesmen are destined for success. He was obsessed with how he appeared to others. As such, he was a failure according to his own standards. It is apparent that Willy’s career recollections are exaggerated and that he never was a good salesman. In his prime he was at best a poor to mediocre salesman who claimed to be admired by many people. Putting his faith in personality, Willy ignores the American success tradition that is based on virtue, character development, and hard work. For him, commercial success is attainable through one’s popularity and charisma. He dreamed of being like Dave Singleman. Willy thought that being popular and having a good physical appearance meant that a person would attain his American Dream. It is apparent that his career strategies were based on a false set of beliefs. He was obsessed with the superficial qualities of attractiveness and likeability. Willy appears to have been obsessed with his goal of being known as a great salesman rather than with actually being a great salesman. He took little or no delight in the activity itself. He did not love the drudgery of his work. Willy never even mentions what it is that he sells. He was unable to adapt to the ways in which his firm conducted business. He could not connect with a new generation of customers. Willy believed that his old style and techniques could succeed. He did not learn from his mistakes. Willy spent his life pursuing the wrong dreams for him. The wrong dream slowly possessed his life. One’s dream needs to be based on the reality of hard facts. Discernment is needed to determine what one is both good at doing and loves doing. Willy did not have such self-awareness. He did not pay attention to himself. Throughout the play, it is apparent that Willy is wonderful at working with his hands. Good at carpentry, he makes many home improvements, puts up a living room ceiling, builds a porch, and fixes things that need to be repaired. He was happy when he was working with cement. Unfortunately for Willy, he was unimpressed with such physical labor and always pictured himself as a great salesman.